Oh you guys are funny, but thanks so much for the props. I love knowing you guys are forgetting work, sneaking places to read because you’re supposed to be doing something else, refreshing the screen awaiting on the next installment, staying late at work to see if I posted something late, burning food, and reading while driving. when are you going to introduce Andrew as Paul’s brother? Soon. I’m trying to build up the sexual tension, the plot, the subplots and the many different characters that will have an impact on the story. I should say you need to watch Rachel. Although the Meadows are the biggest of Shane’s problems, I wouldn’t discount this chick as someone who’s just a nuisance. Women are the best red herrings in a story. They like to drop verbal clues as to what’s really going on behind he scenes. if paul’s gonna die, which i love, then will there be a sad ending? I ‘member you saying a long time ago that you had wrote a sad ending for one of your books or was going to do it. Please don’t make it this time. I love this story. I love Shane. She started out somewhat similiar 2yr others but then she’s a little different. Stronger, but like me and keeps her emotions in check. I really like her and i don’t want anything to happen to her. I think that’s all the real responses. If there are anymore, please add them to below and I’ll respond. (really I will) I’m reading and loving your comments so keep ’em coming. 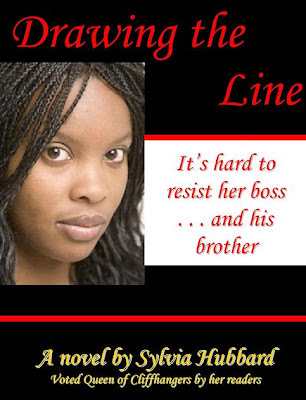 I’m reading this great story called Drawing The Line by author, Sylvia Hubbard and I know you’d enjoy this writer’s work just as much as I am. I encourage you to visit and read along with me. I’m going to take my flash home for Thanksgiving to post something cause I know making you guys wait for five days would be real torture, although one of you did call me mean, LOL. I’m not that mean though, ha ha… hmmmmm.